To truly relax during your vacation in the Kennebunks, a spa treatment is always special. Whether you prefer a manicure and pedicure to show off at the beach, or a deep tissue massage for your muscles after a day on the high seas, the spas of Kennebunk have every treatment you could want and desire. The Breakwater Inn and Spa on the Kennebunk River is open year round for your pampering pleasure. The Captain Lord Mansion has an on-site Spa Room and the Rhumb Line Resort can bring Spa services right to the Inn/Resort with advance reservations. The Seaside Inn is pleased to make all of your arrangements at one of the local nearby spas. The Spa at Rivers Edge, Village Day Spa and Cottage Breeze Day Spa all offer beauty salons with hair and nail services, facials and waxing, massage and full day of beauty treatments which include hair and make-up application by professionals. Brides love Kennebunkport weddings, and our local spas have day spa specials for the bridal party, including up-dos, nails, hair and make-up, even complete makeovers. Bachelorette parties and girls night out events can be arranged at these spas to pamper you and your friends. Men will find signature treatments just for them, including skin care, Swedish massage and haircuts. Located directly on the Kennebunk River with Beach and Ocean views. Experience chic water view inn rooms, cottages hanging over the river or spa rooms each with a river view. One of the most historic Kennebunkport hotels and inns with all the modern hotel comforts of today. Full service spa complex to indulge in exclusive signature spa treatments. Guests delight in innovative cuisine at Stripers Waterside Restaurant, taking pleasure in the freshest seafood, lobster and shellfish from the New England Maine Coast. Our on-site Spa is perfect for a relaxing and pampering escape and offers special couples treatment options. Come experience Kennebunkport’s only AAA 4 Diamond inn. 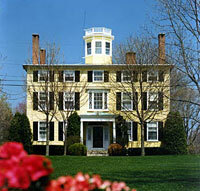 Imagine a relaxing and luxurious bed and breakfast inn, ideal for a romantic Southern Maine Coast getaway. Your lodging accommodations are meticulously decorated and designed to offer you a serene interlude filled with special romantic touches such as gas fireplaces, oversize 4 poster beds, double Jacuzzi tubs and hydro-massage showers. The Mansion offers timeless elegance and warm hospitality for the discriminating traveler. It is an inn with impeccable attention to guest’s needs and desires.